Margaret Atwood. Curious Pursuits. A Reader's Companion and Study Guide. "'Whenever I resolve to write less and do something healthful instead, like ice dancing - some honey-tongued editor is sure to call me up and make me an offer I can't refuse. So in some ways this book is simply the result of an under-developed ability to say no.' Collected and published in the UK for the first time, here are essays and journalism from the brilliant novelist and poet. Ranging from book reviews of John Updike and Toni Morrison to an appreciation of Dashiell Hammet; an account of a journey in Afghanistan that sowed the seeds of The Handmaid's Tale; passionate ecological writings; funny stories of 'my most embarrassing moments'; obituaries of some of her great friends and fellow writers: Angela Carter, Mordecai Richler, Carol Shields. 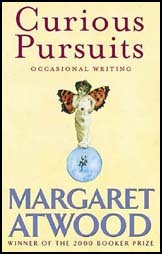 This is an insightful, thoughtful and revealing record of the life and times and writings of Margaret Atwood from 1970 to the present." —The Publisher.